Happy fall, y'all! I'm one of those people who mourns the end of summer. I love my garden, sunny days, the beach, long days, hot nights (in our air-conditioned house), barbecues... by the time the first day of fall comes I'm a bit bummed because I know it's a slippery slope into frost, Christmas frenzies, and blizzards. For some reason fall always seems too short and I don't really get into it. 2011 is the first fall in many years that I'm not enrolled in school and I have time to stop and smell the chrysanthemums. I'm celebrating by cooking and baking all things fall. So what if my nights of enjoying bruschetta with home-grown tomatoes and fresh basil are over? And why get sad because darkness falls shortly after I return home from work (or sometimes before I even get home)? It's fall, y'all, so I'm making the most of it starting with one of the most popular fall flavors, pumpkin! I'm a fan of the Starbucks Pumpkin Spice Latte. I know, I know... I'm on the bandwagon. But it's really good (and I'm looking forward to trying a Salted Caramel Mocha this weekend). I've only had one this year because I like to eat my calories, not drink them (plus I don't pass Starbucks on my way to work... keeping it real). 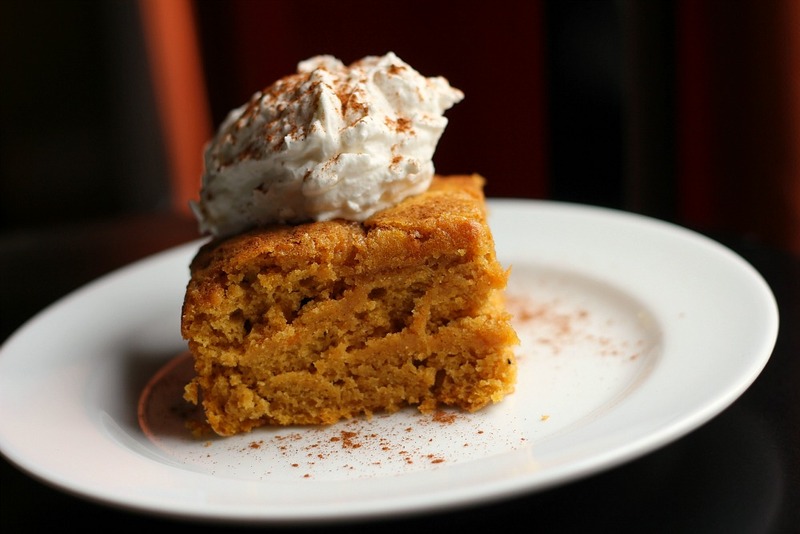 This cake is inspired by the famous Pumpkin Spice Latte... except that it has no coffee. 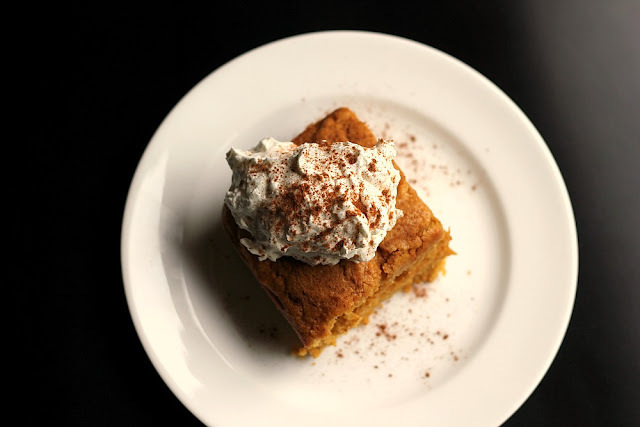 It's super-moist, subtly spiced and topped with a cloud of fresh whipped cream. I considered topping this cake with cream cheese frosting (which would also be fantastic), but instead I went for fresh whipped cream. The pretty fluffy cloud of whipped cream topped with a sprinkle of cinnamon reminded me of a fancy coffee drink, so I went with it. This cake is a hit at my house. It's still moist (we're headed into day three) and I'll admit that I've eaten it straight up with my coffee for breakfast. This is one of those desserts that can easily be made in advance. I like to whip my fresh whipped cream right before serving, but if you're feeling exceptionally lazy you can use the stuff in a can. It's not the same, but it will do. Kick off your fall baking season with this cake! Preheat oven to 350°F with rack in middle. Spray an 8 or 9 inch square pan with cooking spray and line with parchment paper (or coat with flour). Make cake: Whisk together flour, baking powder, baking soda, salt, and spices. Beat butter, brown sugar, and vanilla with an electric mixer at high speed until pale and fluffy, 2 to 3 minutes. Add eggs one at a time, beating well after each addition, then beat in pumpkin. At low speed, mix in flour mixture until just combined. The batter will be very thick. Spread batter evenly in pan and bake until golden-brown and a wooden pick inserted into center comes out clean, about 35 to 40 minutes. Cool in pan 15 minutes. Run a knife around edge of cake to loosen, then invert onto a plate. Reinvert cake onto a rack to cool completely. Cut into squares and serve topped with a dollop of fresh whipped cram and a sprinkle of cinnamon. im going to try this. We are going apple/pumpkin picking but we never do much with the pumpkin and we were trying to think of things to do so this is great. Thanks! I'll let you know how it turns out. Hoping this comment comes through* I love pumpkin spice cake, anytime of year. This looks simple enough, i need to try it very soon! Mmmm mmm mmm! This looks amazing! And I was just looking for a dessert recipe for Thanksgiving... It looks like this will fit the bill.